The color of these blooms will blow you away. They are so bright and colorful. I just cant believe how much color this flower shows off, it is breath taking! Orange Daylily is a perennial which, in the blooming season, produces violently orange flowers and emerald green leaves. The Orange Daylily is clump-forming, and can slowly spread on its own to fill areas and act as a semi-evergreen ground cover. 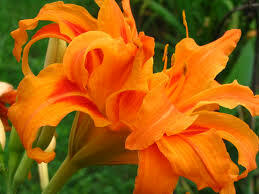 The Orange Daylily is particularly cold-hardy, though in mild winters it is likely to begin blooming somewhat early. The flower is a great plant to have in your landscape because of its bright, vibrant bloom that it can give you come spring to summer months. Orange Daylily is a great centerpiece to have. Buyers should note that a daylily will almost certainly bloom the first year it is planted, but that it is unlikely to reach its full height until the second or the even third year after planting. These beautiful flowers can grow to be up to eighteen inches tall and also bloom through the autumn months if the weather is good. They love to be located in moist and well-drained soils and brings a lot of spectacular colors when they are in bloom. These plants are very easy to grow and are beautiful perennials as they grow back each year after being planted. They normally grow back thicker than the year before. These flowers also work great to create beautiful borders as they can grow to become very thick. Orange Daylilies are well-known for their vibrant, orange blooms that you can sometimes see growing along roadsides around the country. It is an extremely hardy, adaptable perennial that does well in most any type of soil, whether in the sun or shady gardens. They will grow around 48” tall and up to 20-24” wide, so when planted, they need their space to reproduce. Butterflies and hummingbirds love them. However, they require little to no maintenance. Besides its deep orange trumpet of color, it also has long slender leaves and works wonderfully in adding texture and color to a flower bed, borders or natural area. 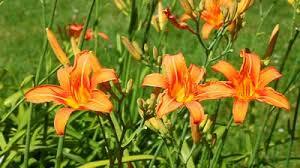 Orange Daylily supply a very natural look and feel and look amazing when added to gardens and natural areas. Daylily plants create a beautiful garden scene. The Latin name for Daylilies is Hemerocallis. They are related to thousands of species of the lily family. These unusual plants are well known for their ability to multiply. From a single daylily plant, up to 50 plants will bloom in Zones 3 to 9 from July to August. Daylily roots spread beneath the soil and create new growth that pushes through earth reaching for sunlight and rain. They are available in a wide range of colors and variegated hues and require no maintenance after they are planted. Since daylilies grow up to two feet tall, they need room to spread out. They have long, slender stalks with a profusion of elongated leaves that remain low to the ground. The effect of blooming daylily plants is stunning. These plants make an excellent soloist in a garden, or they can be a backdrop to smaller plants. When planting daylilies with other plants, choose species that won't spread or interfere with the natural growth of daylilies. Plant daylilies in a variety of colors such as yellow, orange, deep purple or white to capture attention. Daylilies can be planted with other tall flowering plants like Lavender, Gladiola or Liatris. 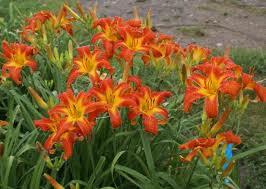 To use daylilies for borders, plant them with hens and chicks, variegated Hosta, Astilbe or feathery Achillea. Daylilies prefer full to partial sun and are perfect for steep slopes, embankments and other areas where it is difficult to grow grass or other plants. Daylilies also make ideal foundation plantings due to a wide variety of colors. The shape of the daylily flower begins with a small green shoot from the tall stem. There are three sepals and three petals on each flower. The inner portion of the bloom may be a darker color than the outer petals. Blossoms generally fall off at the peak of maturity while the leaves remain until the first frost. It's advisable to remove any remaining flowers on daylily stems. Daylilies are one of the least expensive plants. However, since they tend to spread quickly and are unusually hardy, for a large garden six daylilies should be sufficient. By the end of summer, six plants may increase to a dozen or more. These can be transplanted or divided. Plant daylilies about four inches deep in the soil. Daylilies are not fussy about the type of land. They can survive extremes of temperature and still flourish. These plants are generally sold in clumps and can be immediately inserted into garden soil. Give the ground a light mist of water at planting time. There are two ways to grow daylilies indoors. The first method is to start them outdoors in pots and bring them in before the first frost. The second method is to start them from roots and bulbs. Growing these plants indoors requires full sunlight and warm temperature of at least 70 degrees. Indoor daylilies need pots with good drainage.